August 7, 2006 - Last night we were watching "Lost" when I heard some clanging outside. I went out on the balcony to see what the noise was all I could see were a few garbage trucks in the street so I thought that was it. After a few minutes it got much noiser and I realized it was the "Cacerolazos" were back. The first big "cacerolazo", or pan banging protest, took place in September of 1996... Carlos Menem was president. He said the cacerolazo I heard was to protest violence and insecurity on the streets. Strangely, the people who feel the most insecure are the ones who live in higher class neighborhoods like Recoleta (where we live) in his neighborhood, only about 6 blocks away, there was complete silence. Cacerolazo is the name of a popular form of protest that consists in a group of people creating noise by banging pots, pans and other utensils in order to call for attention. The word comes from Spanish cacerola, which means "stew pot". The derivative suffix -azo denotes a hitting (punching or striking) action, and has been extended metaphorically to any sort of shock demonstration. The term cacerolazo in the above sense was first used in Argentina during 2001, as the colloquial name of the protests and demonstrations of the middle-class people who had seen their savings trapped in the so-called corralito (a set of restrictive economic measures that effectively froze all bank accounts, initially as a short-term fix for the massive draining of bank deposits). The corralito meant that many people who needed a large amount of cash immediately, or who simply lived off the interests from their deposits, suddenly found their savings unavailable. As court appeals were slow and ineffective, people resorted to protest in the streets. As the Argentine peso quickly devalued and foreign currency fled the country, the government decreed a forced conversion of dollar-denominated accounts into pesos at an arbitrary exchange rate of 1.4 pesos per dollar. At this point the unavailability of cash for people trapped in the corralito compounded with the continuous loss of value of their savings, and the unresponsiveness of the appeal authorities (minor courts and the Supreme Court itself) further angered the protestors. A protest and cacerolazo in 2002. The large sign reads "Thieving banks - give back our dollars". The first cacerolazos were spontaneous and non-partisan. 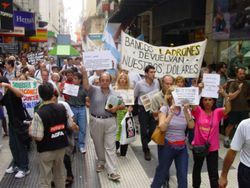 While in Argentina most demonstrations against government measures are customarily organized by labour union activists and low-level political recruiters among the lower classes, and often featuring an assortment of large banners, drums and pyrotechnic devices, cacerolazos were composed mostly of spontaneously gathered middle-class workers, housewives and professionals, who used not to be involved in grassroots political action of any kind. After a time, however, the cacerolazo became an organized phenomenon, often of a violent nature, directed against the banks. Many of them were attacked, their facades spray-painted, their glasses broken, their entrances blocked by tire fires, or even their facilities occupied by force at times. In order to avoid further violence, especially with the deadly December 2001 riots still fresh in the memories of Argentinians, the government decided not to use active police force against the cacerolazos unless absolutely necessary, and to restrict most police presence to barricades in critical spots, a policy that was followed also with piquetero marches of unemployed people asking for state welfare and jobs. Isolated cacerolazos also featured during the apagón ("blackout") of September 24, 2002, to protest against increases in public service fees requested by the providers. As the financial and macroeconomic conditions became more stable, the government loosened the restrictions on the withdrawal of deposits, and the cacerolazos died out.